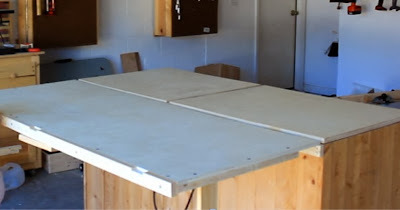 Simply Easy DIY: DIY Table Saw Workstation Part 3 - Out Feed Support. DIY Table Saw Workstation Part 3 - Out Feed Support. Out feed support is something that I have been wanting for some time now. It allows you to concentrate on other things in regards to the cut. You know that saying about best laid plans? Well, that is exactly what this project turned out to be. You would think that something as simple as attaching a piece of ply with a hinge would be simple. However, there were a lot of different factors that had to be taken into consideration. I have learned from past experience that building something based on plans alone and not with an eye towards your specific circumstances usually leads to a waste of time and materials. You have to look at what is important to you. What is your current situation. I always make a set of criteria for a project. I list them in order of importance and I never trump an item on the list. 1 1. Low profile when not in use. 2 2. Support legs touch the ground. 3 3. Set up in 2 or 3 steps Max. Why were each of these things important in this project? Well, the workstation is mobile and is stored against the wall in my garage so the profile needed to be slimming and not take up a lot of space so the station did not protrude any further from the wall than it already did. The support legs needed to touch the ground to prevent the possibility of tip over. I did not want to run the risk of one of my children coming by and trying to see over the top and toppling the unit. I take great care in teaching my children about the dangers of daddy’s tools but they are children and I am not all seeing at all times. Plus, things happen, lets just eliminate that possibility. Set up in 3 steps max. I know how I work. I don’t like to go through a lot of steps to set something up and I tend to avoid doing it if I feel it is a hassle. I want to be able to set it up, make my cuts, fold it back down and call it done. So with these things in mind I thought long and hard about how it should be done. I had a plan and plans are what every woodworker says is vital to the success of your project. So I went out to the garage one morning with a steaming cup of joe, stared at the workstation for a while, then did what any red blooded woodworker would do. I promptly threw my plan in the trash and winged it. “AH HA” moment. Then I felt like a goat because I hadn’t thought of it sooner. The legs I had planned to attach in a similar fashion with the carriage bolts so that they could flip all the way around and store flat against the out feed when folded down. However, I failed to account for the height of the legs. The out feed is 24” wide. The legs needed to be 35”. That left almost an entire foot that would store above the workstation’s top when I folded the legs around. This was simply unacceptable. So I had to rethink what to do with the legs but still work within the confines of my three criteria. The original legs were to span the entire length of the out feed support which would provide needed rigidity to the ½” ply and keep it from sagging in the center. You can somewhat see them in parts of the video when I used them to support the out feed table while I attached furring strips that would be used for support instead of the legs. The redesigned legs are about as simple as simple will ever be. Just some scrap 1x4s that I attached some utility hinges to, then mounted to the underside of the out feed table. I also attached a scrap piece of pine to the front furring strip of the out feed table. It rotates in to hold the legs up as I lift and fold the top. Well, I have made good progress on my new and improved workstation but I still have a few things to do. Got a question. When you attached this to your table, how did you put your fence on it at the same time? Doesn't look like there are any gaps for the fence to clamp on. How did you put your fence on the table with the out feed up?